After two nights in Anuradhapura, we leave and begin out drive for the ancient city of Polonnaruwa. On the way we stop at Aukana Buddha, one of the reservoirs constructed during the reign of King Dathusena, where we can see a magnificent 12 metre high statue of the Buddha. Polonnaruwa remains one of the best planned archaeological relic sites in the country. Built in the 11th and 12th centuries AD, Polonnaruwa is a listed World Heritage site. Here you can see the ruins of the Royal Palace, the Gal Viharaya, and four statues of the Buddha in ‚Upright‘, ‚Sedentary‘ and ‚Recumbent‘ postures carved out of rock. Polonnaruwa is laid out over a large distance therefore the best way to explore the area is by bicycle. We take a guided tour of the ruins. You may have time to explore the ruins by bike (optional). The following morning we head to Sigiriya, (Lions Rock), an impressive site from a distance rising 200 metres from the jungle. With hundreds of steps to climb to reach the top of the 5th century rock fortress, the view from the top over the surrounding landscape is incredible. Here you can also see the world-renowned frescoes of the ‚Heavenly Maidens‘ of Sigiriya. Our next stop is Kandy but first we will have a couple of stops along the way. In Dabulla, we visit the most impressive of Sri Lanka’s cave temples which were used by the monks as meditation locations and places of worship. Some contain statues, paintings of the Buddha and detailed frescoes. We will also make a stop at a Spice and Herbal Garden where you will get shown the locally grown flora and some of its uses in medicine and cooking. We then introduce you to Kandy with a brief orientation tour. Kandy was the last capital of the Sri Lankan kings of the central hill regions, and of course is World Heritage listed. We will take a drive around the Kandy Lake, built by the last Sinhala king Sri Wickrama Rajasinghe in 1798, visit the Kandy town and Bazaar, the arts & crafts centre, a gem museum and a lapidary. In the afternoon you will have some free time to enjoy the city. You will find that Kandy is probably the best place to buy most of the handicrafts produced in Sri Lanka. Tonight we will take a sunset tour of the Temple of the Tooth (where legend has it Buddha’s tooth is kept) and watch a cultural show featuring traditional Sri Lankan dancing. Early in the morning you leave for visiting the impressive Horton Plains National Park. Once a haven for elephants they no longer inhabit this area, however it is possible to witness many other species of wildlife. The area is surrounded by the country’s highest mountains, shrouded in cloud and rivers. This is the only National Park in Sri Lanka in which visitors are allowed to walk around freely so we will take the opportunity for a trek through the high mountain vegetation and lakes. Our goal is ‚Worlds End‘ where the 2000 metre plateau comes to an abrupt end, plunging 700-1000 meters to the valley floor. On the way we will see a great deal of wildlife, including with purple­faced langurs, wild boar and barking deer as well as a small number of leopards. We board a train from Nuwara Eliya and enjoy the slow pace through the mountain scenery as we head to Ella. Ella is a sleepy village in Sri Lanka’s Hill Country. 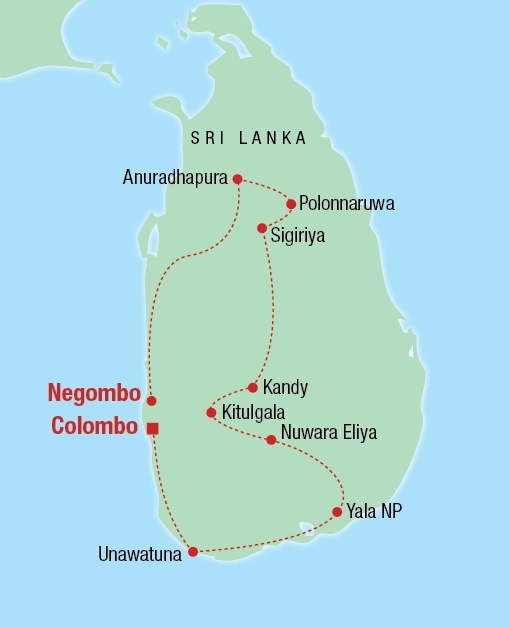 We now return to Negombo. On the way to Sri Lanka’s administrative capital, we visit a Turtle harchery . 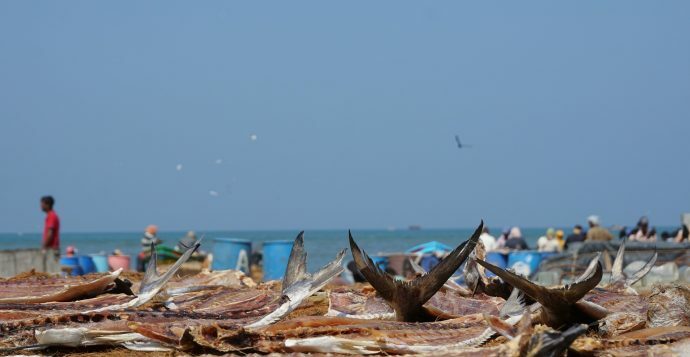 From Negombo we can enjoy a city tour of Colombo. It is a busy and vibrant city with a mixture of modern life and colonial buildings. Enjoy driving through the Commercial area or the ‚Fort‘, so named because both the Portuguese and Dutch had a fort here. We drive past ‚Pettah‘, a hectic bazaar full of ancient vehicles, bargains, mosques and temples, then visit a Hindu temple and drive past Jumi-UL Alfar Jumma Mosque. We continue through the Wolvendaal Dutch Church, Hultsdorf Law courts, to the residential area of Cinnamon Gardens and on to Independence Square and Bandaranayake Memorial International Conference Hall. Diese Tour startet mehrmals im Monat und beinhaltet 13 Übernachtungen in Hotels und eine Übernachtung im Zelt.